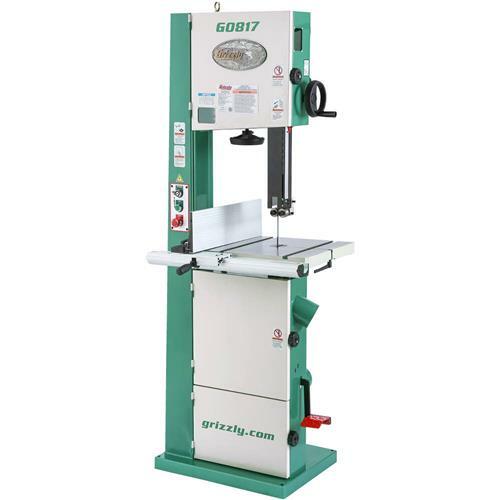 Nicknamed the "Resaw Pro" for good reason, this Super Heavy-Duty 14" Bandsaw features an industry-leading 14" resaw capacity, 2 HP motor (prewired for 110V), one-piece reinforced steel frame, ultra-solid rack and pinion upper guide post, and a deluxe 2-position 6" tall resaw fence. But that's not all! 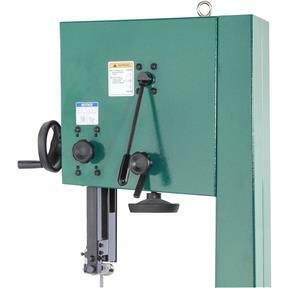 This saw is also equipped with heavy cast iron wheels, heavy-duty cast iron table trunnions, and a foot brake that stops the wheels in seconds, improving both the safety and efficiency of your work. 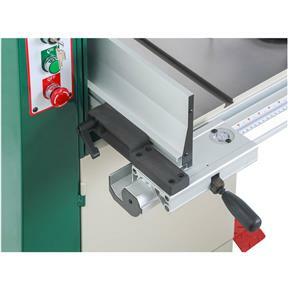 For those who prefer using different styles of blade guides for resawing than curve cutting, this bandsaw features an exclusive interchangeable blade guide system that allows you to easily change from the included dual-bearing blade guides to an optional Euro-style roller-disc guide. 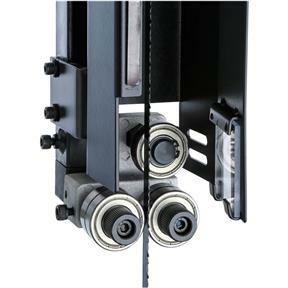 The hinge-open design of the blade guard also makes it quicker and easier than ever to change blades and make routine adjustments to the blade guides and support bearings. 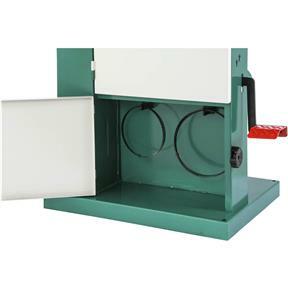 Last, but certainly not least, dual 4" dust ports provide nearly perfect dust collection, and there is a special storage area at the bottom to keep extra blades or the included miter gauge when not in use. CSA certified meeting CSA C22.2 #71.2-10 and UL 987-8 standards! 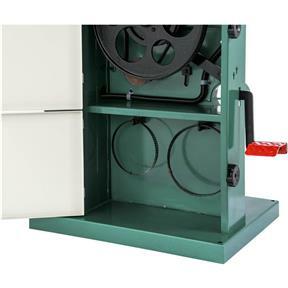 Floor to table height: 37"
Approximate shipping weight: 388 lb. I bought this saw a little over two years ago as my first major purchase of Grizzly tools and was initially pleased with the purchase. The saw was used lightly since I have two other Delta band saws and use this only for heavy re-sawing. I can not understand how the upper wheel locked and caused the tire to be chewed-up. The up side is that Grizzly does have the parts. I ordered an extra bearing so that I am not left out of commission again. Probably a little overkill for a home garage, but it is soo much better than the other options out their for this price point. 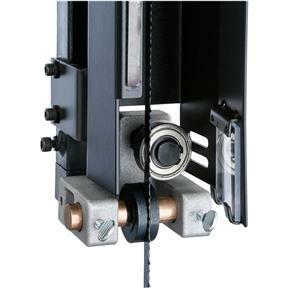 Get the Bear Crawl Base by Grizzly and not the D2057A recommended in the product manual. Wonderful bandsaw, I sawed 1 1/4 boards out of a 88 chunk of wood 3 feet long with ease. Would recommend it to anyone. I purchased this machine several months ago and now have some projects to show what it is capable of when set up. This is great machine cant say enough good about it. 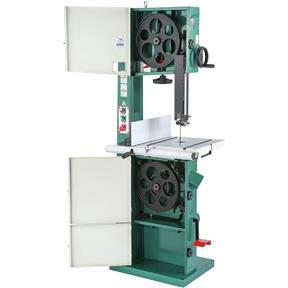 It has performed in Re-Saw, Veneer Slicing, Staved Segments, and Segments. I did notice that someone commented on Blades for it. 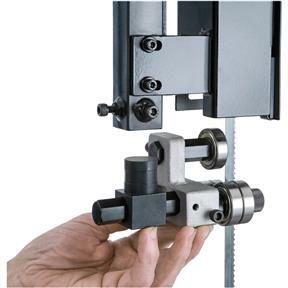 Timberwolf will make them for this saw, you can get any blade for any application that you wish. So don't let the 120" blade concern you. 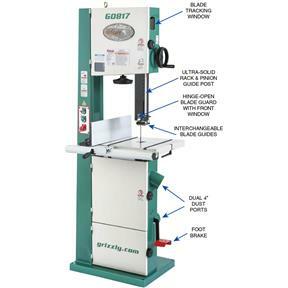 this band saw does everything I need then some, delivery was on time, sales personal were very helpful, I would recommend this product. Haven't used the saw much but have it set up and have done some sample cuts, one re-saw of curly maple 8" wide. It did a wonderful job, well pleased with the saw. Very well built, balanced and smooth running with plenty of power. Looking forward to a long relationship with a great band saw. Thanks again Grizzly. Glad I bought this model. It is a great machine. Have not done a lot with it yet, but I soon will. So far it has performed great. I have no issues with it at all. Just getting used to it, and so far, I love it. Be sure to get some real blades before it arrives, so you can start doing work with it. The blade that comes with it is just a mediocre blade, and will cut cross pieces OK, but it is pretty much useless for other uses. Why Grizzly does not at least put on a quality blade at their warehouse, is beyond me. Yes I would recommend it. 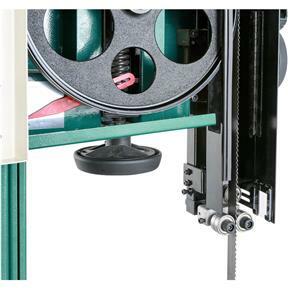 When I unpacked this bandsaw I was surprised to see the size of the guide rollers and rigidity of the frame. First thing I cut was a pc of alder into 4" by 1/8" pcs and the results were fantastic. I'm sold excellent machine. Arrived in good condition and have it up and running. Seems to be well made and I am happy with my purchase. I replaced my old Grizzly 15" bandsaw with this Super Heavy-duty 14 " band saw because of a few things. One might think it was a set back to go from 15" to 14", but that rarely made a difference in what I'm using it for. I spent good money on the old saw's after market fence, but the new Super Heavy Duty 14" came with a fence specifically designed for re-sawing. Then I knew I needed a re-saw height greater than what most other saws offered. This saw accommodates me with those extra few inches past 12". Lastly, the design makes it easy to quickly adjust and see the band tension each time I step up to use it. It's different heavy, but the mobile base I purchased from Grizzly for the old saw worked great with the Super "Heavy" Heavy-Duty 14" bandsaw. This will likely be my last bandsaw ever!